I Quit! I Quit! I Quit! Vul uw e-mailadres voor The Click Five gerelateerd nieuws en updates. The Click Five are an American rock band. 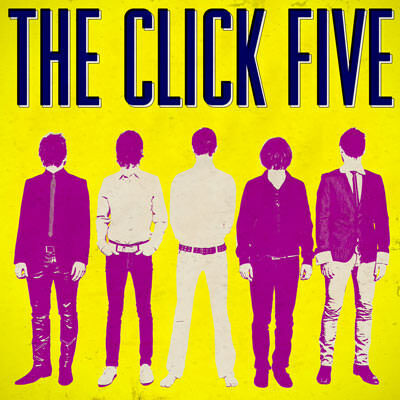 After releasing two albums on Lava Records - “Greetings from Imrie House” (2005) and “Modern Minds and Pastimes” (2007) - with combined worldwide sales of over 2 million, three gold records and eight different #1 singles in seven countries (including a #1 song in the US), The Click Five have released their third studio album, "TCV", on Lojinx in Europe. Before starting work on their new album, the band completed a tour of Southeast Asia in 2008 as part of MTV EXIT's initiative to end human trafficking. This tour saw them making history in Cambodia, performing the first rock concert ever held at Angkor Wat Temple (co-headlining with Placebo) and headlining Olympic Stadium in Phnom Penh to an audience of over 30,000. In December, 2008, they finished out a tremendous year with their first solo show in Beijing to a sell-out crowd. Returning home to Boston, where they all met while attending the Berklee College of Music, feeling inspired, and with a renewed energy after their successful tour, the band went straight back in to the studio with producer Mike Denneen (Fountains of Wayne, Aimee Mann) to begin recording their third album. The new album, "TCV", showcases the band's undeniable talent for writing timeless pop songs with an edge. As their sound and song writing matures, the band’s strong fan base has followed, turning even small warm-up shows in to an event. With a broader appeal than ever before, and a live show that rivals that of any other major rock band, this is The Click Five at their finest. The Click Five are Ben Romans, Ethan Mentzer, Joe Guese, Joey Zehr & Kyle Patrick.